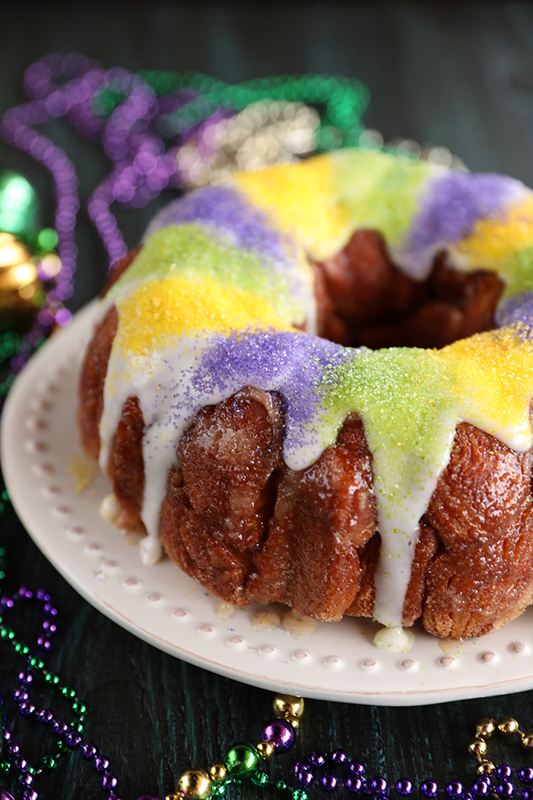 Mardi Gras season is here and that means King Cake! I have several variations on the blog, this quick and easy version, and a more traditional one here. 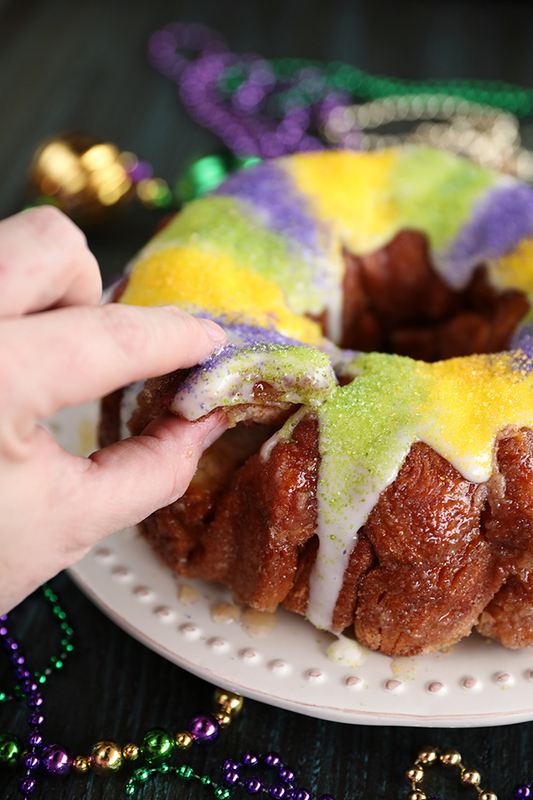 Want to know what all this King Cake stuff is all about? Check out this post Laura did for us a few years back. It’s filled with great info and history of the sweet confection. 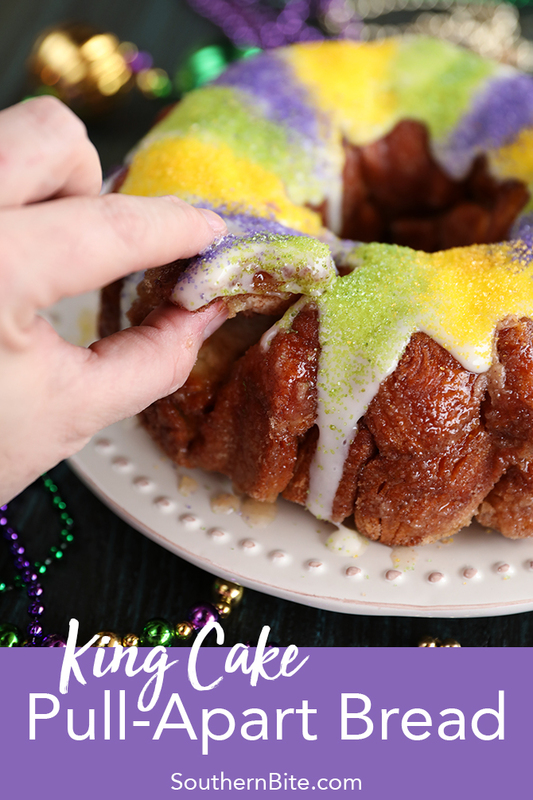 Now, on to this one… My other pull-apart breads have been so popular, I just wanted to offer one more take on the King Cake with that in mind. This simple recipe is actually an amazing breakfast as well as dessert. And while most modern King Cakes have fillings (cream cheese is my favorite) I just did a cream cheese icing to keep it easy but still have that great flavor. Preheat the oven to 325°F and spray a Bundt pan with nonstick cooking spray. Open the biscuits and separate them. Cut each biscuit into quarters. Combine the sugar and cinnamon in a gallon size zip-top bag and add the biscuits. Seal the bag and toss to coat the biscuit pieces. Place the coated biscuit pieces in the prepared pan evenly. In a small bowl, combined the melted butter with the remaining sugar and cinnamon mixture left in the ziptop bag. Mix well and pour over the biscuit pieces. Bake for 45 to 55 minutes, or until the biscuits are cooked through. Cool in the pan for 10 minutes then invert over a serving dish and allow to cool some. To make the icing, place the cream cheese in a microwave safe dish and microwave it for 15 to 20 seconds or until nearly melted. Combine the powdered sugar and heavy cream (or milk if you don't have heavy cream) with the melted cream cheese. Add a sprinkle of powdered sugar if it's too thin or a drop or two of milk if it's too thick. Drizzle the icing over the partially cooled bread and then decorate with the colored sugar. Serve warm. I like that you used canned biscuits. Makes the dish totally more doable! Yes! They are such a great shortcut! 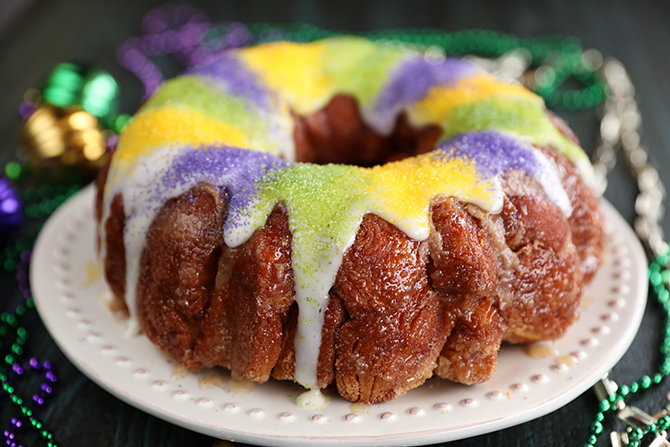 I’ve never had a king cake of any type, but flying into New Orleans next week. I may have to try one. This version sounds delicious though!! You absolutely should! So much great food there! Love your version of Kings Cake! Wish I had thought of it! To the lovely holiday adding to New Orleans,biegnets!! !Soft, pillows of yumminess! Probably spelled that wrong, but have a Pinterest board of foods for Mardi’s Gras,and had them 1 time, no clue what they were. With a friend that had lived there, she was so shocked that I was eating one, in Green Bay, Wisconsin!Never could find them again. Ugghh! So gotta make them myself, is SO worth it!! Thanks again!! Love your version of Kings Cake! Wish I had thought of it! To the lovely lady goingto New Orleans,biegnets!! !Soft, pillows of yumminess! 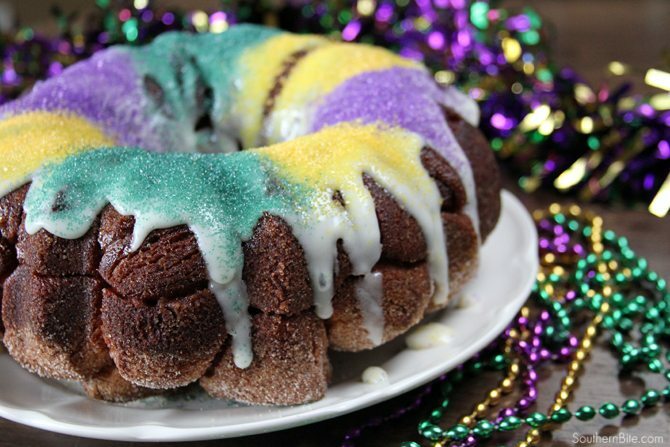 Probably spelled that wrong, but have a Pinterest board of foods for Mardi’s Gras,and had them 1 time, no clue what they were. With a friend that had lived there, she was so shocked that I was eating one, in Green Bay, Wisconsin!Never could find them again. Ugghh! So gotta make them myself, is SO worth it!! Thanks again!! Hi Stacey. I just made this cake and it’s delicious! Plus, it was so quick and easy which is great because I’m not much of a baker. I actually bought my first ever bundt pan last week just so I could try this recipe. By the way, I skipped the sprinkles and the baby. I used half and half for the icing and it came out good. Also, in case anyone is interested, for the sugar I used half a cup sugar and a half a cup Splenda and we think it came out great. Thanks again, Stacey. I will definitely be making this one often! Wonderful! So glad to hear that it turned out great for you! And thanks or the tips! 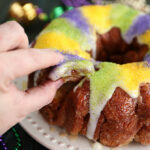 I was looking for a fast and easy king cake and came across this recipe. This was amazing! My family went crazy over it! Thank you for the recipe, I will definitely be making it again. So glad y’all enjoyed it, Aimee! !